Published Sep 18, 2015 by Prentice Hall. 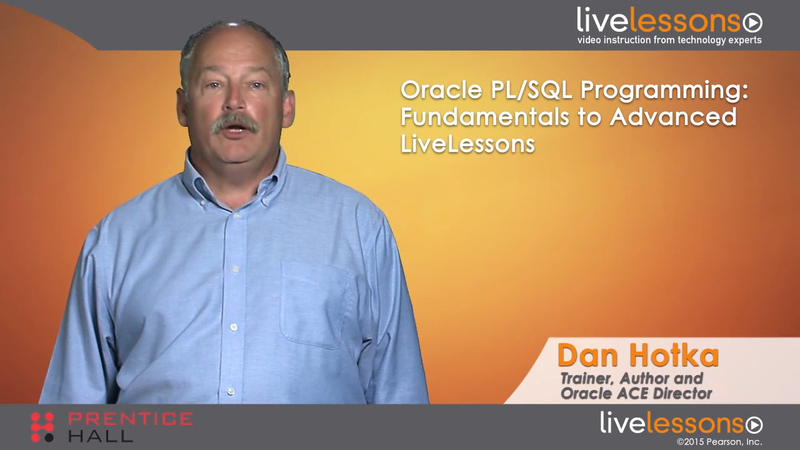 Oracle PL/SQL Programming: Fundamentals to Advanced LiveLessons begins with a fundamentals module that covers the basics of Oracle's language extension for SQL and the Oracle relational database. The focus is to give students with a working knowledge of SQL the ability to develop Oracle procedures, functions, and packages using the PL/SQL language. The advanced module teaches developers with PL/SQL experience the new and advanced features of the PL/SQL language along with performance tuning techniques. In the fundamentals module, Oracle ACE Director Dan Hotka teaches developers how to work with existing code and create new programs. Along the way, students will learn both conditional and looping syntax and techniques, error handling and error processing, plus how to work with script files, procedures, functions and packages (a collection of procedures and functions). In the advanced module, Dan demonstrations how to take advantage of better options for performance, gain knowledge about the newer features of the language, as well as actually work with these same features in hands-on lab exercises. The students will learn the latest features of PL/SQL collections, triggers, and a variety of compiler features such as conditional compilation, result_cache/deterministic features for functions, autonomous transactions, optimizing compiler features, and more. Dan covers additional exception processing useful for collections. The advanced lessons include useful extensions to the error processing part with a clever use of database triggers. This advanced module also covers a variety of PL/SQL performance tips and the tuning and debugging tools for the PL/SQL programming environment. This LiveLessons course contains hands-on lab exercises throughout, and three common tools are used for demonstration, including SQL*Plus, Toad, and SQL*Developer. Students can use the Oracle PL/SQL development tool of their choice to do the hands-on labs with these lessons. All examples work with Oracle10, Oracle11, and Oracle12 databases, but the concepts and most of the tips apply to any Oracle database.